Have you ever thought about making your own natural, beautiful, handmade soap? I was afraid of working with lye. I was afraid it would flop, and I would have lost a ton of money on soap making supplies. I was even a little worried I would like it TOO much and become one of those crazy soap ladies! I wasn't sure I could make my own soap and have it turn out well. Are you like I was? If you share any of my old fears about making soap, my eBook is for you! This 93 page eBook is a complete and detailed guide to everything you'll need to know to make your own hot process soap and customize it the way YOU want it! You'll get my famous BEST soap making recipe I've ever created, and you'll learn how to add natural herbs, clays, textures, and essential oils to turn your own soap into a thing of absolute beauty and wonder for your family and friends! It's the book I wish I had had when I started out making hot process soap years ago. I searched for information on hot process soap making when I first started out, and found very little out there. This book compiles everything I wish I had been able to know when I started. You'll be ready to get creative with your very own soap after you enjoy this book! "I've been making cold-processed soaps for years, but with Heidi's in-depth look at hot-processed soaps, I have a feeling I might be changing my ways soon! Even with all the soap making experience I've gained over the years, I still learned an awful lot from this book! No matter where you find yourself in the process of making soap, this book is a great resource for all levels of experience!" "This book is so informative. I'm a total newbie and it has everything I need to know about hot process soap making! The soaps are beautiful. They would be great to use and wonderful as gifts! I was interested to learn everything I needed to know about lye and why you use it for soap making. I can't wait to start making my own soaps for my family! There is tons of information in the book for newbies but even seasoned soap makers would love this book! There are a variety of recipes included that I can't wait to try!" "I just downloaded your ebook and quickly read through it. Thank you so much for putting this together as it is very helpful. I have been wanting to make soap forever but have been reluctant to do so because it can be so finicky." Many people want to make their own soap, but they are afraid of working with lye. Or they believe they can't do it because it sounds too difficult or complicated. I've run into people who think it will take too much time or they won't be successful. There are many reasons some people have for not starting their soap making fun because they just don't have the information they need. Well, if any of these reasons are why you aren't yet making your own soap, let me assure you this eBook will help you get over each and every one of these! Get ready to find out how to make your very own natural, hot process soap with confidence! Before I began making my own soap, I thought about it a lot. A LOT! Whenever I'd go into a health store, I'd always search out the natural soaps---I just LOVED them! And I'd always think, "I think I can make my own soap!?" But making soap got put on the back burner for many years---I was worried about working with lye, for one thing. And I thought I wouldn't have time. Plus, I think I was afraid I'd become addicted to soap making! Once I began making soaps for our family, and realized all the different things I could do, I actually DID become a bit soap obsessed! It's fun! It's WAY more healthy for your body. And they make amazing gifts! Like, people REALLY appreciate receiving handmade soaps, especially when they are personalized just for them! Have you ever given any thought to making your very own soaps for your family, either for health reasons or just to see their eyes light up? I get asked lots of questions about how to make soap, as well as requests for me to make soap for others--sometimes whole entire loaves! I honestly don't have a lot of time to make loads of soap to sell anymore, so I thought I'd write the perfect guide for those who want to just....GO for it! I say, "Just DO it!" It's easy! It's fun! Hot Process soap making is much faster than cold process soap making, and it's also a more traditional, time honored method. But you'll find out all the details in my book. If you have ever thought about making your own natural soaps for your family, you will love this eBook! ***If you prefer to use a credit/debit card, you can pay securely through my site. Just Click Add to Cart below! With hot process soap making, you create handmade REAL soap within hours. It's usable right away, as there is no long cure time as with cold process soap. Find out how to create your own hot process soap easily! Here are all the reasons you SHOULD make your own soaps! Or at least be sure you are buying quality natural soaps for your family and children. I've made some pretty compelling arguments for why you should consider making your own! In this section, we will take a look at all the different kinds of soap making. The book focuses on the hot process method, but in this section, I give an overview of the similarities and differences between different types of handmade soaps. I love hot process soap making! You'll find out why you will LOVE hot process soap making methods too! In this section, you'll get an outline of exactly what hot process soap making is. You'll also find out how to make your own hot process with confidence. You'll learn about the tools you absolutely must have (and once you have them, you need never buy them again--unless they break, that is), plus a section devoted to safety and how to work with lye without getting hurt. What is Lye, Why You Need It, and What Happens to It? In this section, you'll find out what lye is and why it's needed to make soap. You'll also find out what on earth happens to it! This was always a mystery to me, and one reason I kind of stayed away from making soap for a long time. Does it really just disappear? I have tried LOTS of soap recipes, using different oils and combinations. With all these experiments, I finally found THE one recipe that EVERY one loves! I've even had people tell me they won't use any other soap any more! You will find out how to use this amazing and much-loved recipe to create variations of your very own---or use my recipes! You'll love this soap recipe no matter which variations you try. Once you try mine, you'll be ready to expand and get creative with your very own! This section walks you through every single step in the soap making process in detail, and with pictures. You won't have any questions left over after this. You can print out these pages and use them as references while you work, too! If you are new at soap making, or even just new at making hot process soap, you'll love this part! When I started out making soap, I found lots of cold process tutorials, but no good tutorials for hot process soap making. There still aren't a lot out there. So, here you go! Easy, complete, detailed instructions for making your own hot process soap! You'll find out all kinds of ways to color your soap naturally; add textures, exfoliants, and softeners; and how to scent your soap using natural essential oils. This section gives you a jumping off point for creating your own soaps the exact way YOU want them to be! Pretty exciting! I also give you 21 of my most popular recipe variations. These have been successful in the market place and were the top sellers in my soap shop a few years ago before I stopped selling my soaps. You can use these as they are, make your own adjustments to make them even better, or use them to give you some more creative ideas for your own soaps! There are sections for these recipes based on scent: Natural, Refreshing, Woodsy, Citrus, Spicy, and Floral. I provide lists and color chart, plus a section on textures too. These help make your choices much easier...because the sheer number of possible variations is enormous and for some (like me), a little overwhelming! I help you simplify! If you've ever wanted to make your own soap, but been a little afraid...you'll love this book. If you've hesitated because maybe you thought you'd have to buy too many things....you'll find the things you need simplified. If you doubt your creativity and ability to make amazing soaps everyone will love....doubt no more! With this book, you will be able to make your own beautiful, useful, moisturizing, good-for-you soaps perfectly! I hope you are inspired to make your own soap! I’m a licensed Esthetician and I’ve had a soap making business since 2011 using my farm raised herbs , milk and lard. I got your book with ultimate bundles and I LOVE hot process soap! Great book! Life changing for a soap maker who finds cold process method annoying and fussy! Looking forward to the other fun stuff on your blog! You'll learn how to use herbs to naturally color your soaps and give them extra healthy properties for your skin! "I bought this book from the Healing Harvest Homestead website and was able to download it and print it out at home that day. I came across it because I was interested in making my own soap, but I've been hesitant because the lye always scared me. On the site there was a lot of info and recipes but the book offered a full walk through with pictures, so I went ahead and bought it and I'm glad I did!" "I am so glad that I read this book! The author breaks down everything you need to know about making hot process soap. I've read other books and forums and they all left me with questions and made me so afraid of working with lye. This book is very thorough and made it super clear how to handle the lye solution safely, plus it even answered questions I didn't have yet! I especially love all the recipes and can't wait to try them. I definitely recommend this book!" "Hands-down, the most accessible and enjoyable book on soap-making that I've read. I've made soap several times, so I'm not entirely new to it, but didn't LOVE my results, and had gotten a bit discouraged. This book rekindled my zeal for home soap-making (and reminded me why it's so much better for my family than even the "natural" store-bought stuff.) This is THE soap-making manual I'll keep coming back to - can't wait to try every recipe!" "I'm new to making soap and this is a very comprehensive book. The writer lays out everything from the supplies you will need down to her very own recipes. She even has pictures of each step of the process. I used to be skeptical of making hot process soap because of using lye, but this book breaks it down and tells you exactly what to do. Can't wait for my supplies to get here so I can start!" Added quote: "I have now started selling my own soaps to friends, family members, and the word is spreading fast. This soap recipe is the perfect place to start your soap making business if that is what you want to do! 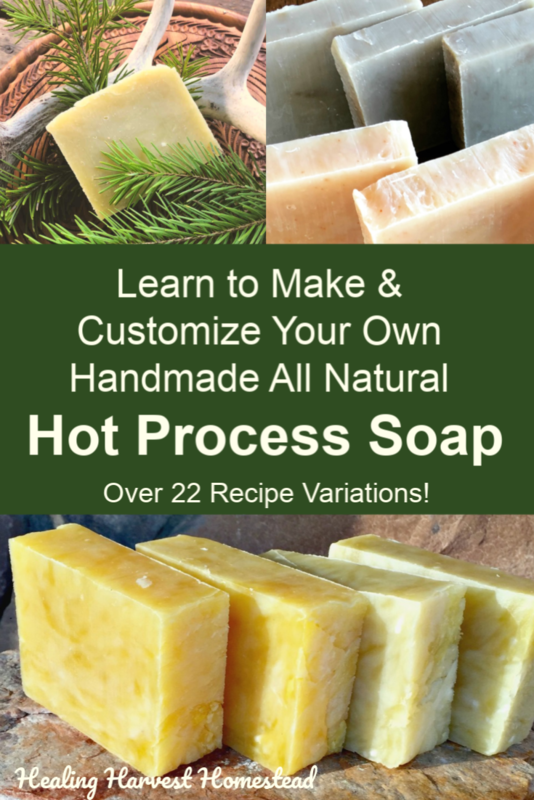 I've had a great time learning to make hot process soap and it all started with Heidi's book."